At The Ohlmann Group, we appreciate art. We appreciate advertising. And, most importantly, we appreciate you. So, this Thanksgiving, we pay special tribute to one of the most famous pieces of American art which would eventually became a legendary piece of advertising. We hope you enjoy the fascinating story behind Norman Rockwell’s Thanksgiving classic, Freedom from Want. In January 1941, eleven months before the United States entered into what would become World War II, Franklin D Roosevelt presented his State of the Union speech, proposing four fundamental freedoms that people everywhere in the world ought to enjoy: Freedom of speech, freedom of worship, freedom from want and freedom from fear. The speech inspired illustrator Norman Rockwell to create a series of paintings based upon the “Four Freedoms” theme. In the series, he translated abstract concepts of freedom into four scenes of everyday American life. The paintings became extremely popular. 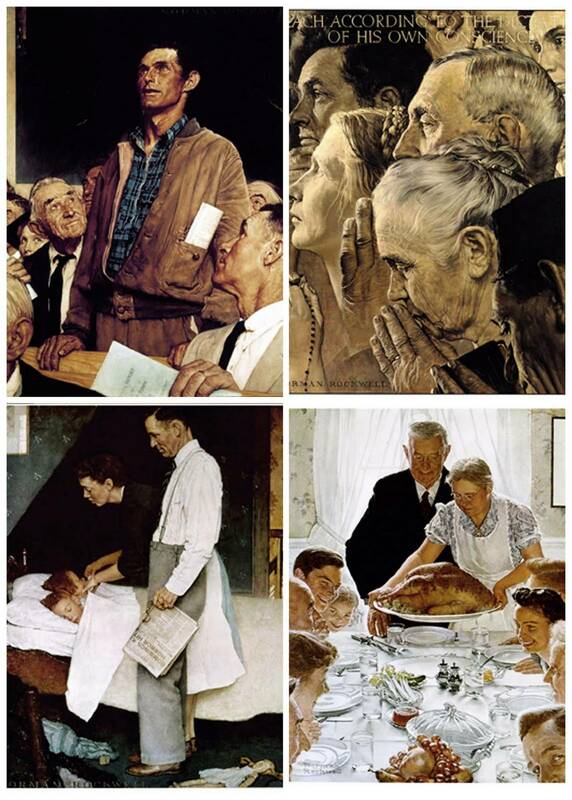 So much so, that the United States Treasury Department toured Rockwell’s Four Freedoms paintings around the country and posted the images on posters during the war effort. The Four Freedoms Tour would eventually raise over $130,000,000 in war bond sales. 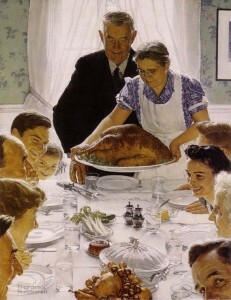 Perhaps none of the series of paintings has endured like Freedom from Want, Rockwell’s picture-perfect ode to the classic American Thanksgiving. Interestingly, the painting was published on March 6, 1943 – months before Thanksgiving –but the painting process began on Thanksgiving Day 1942. The Ohlmann Group is a family company. Not just because of the namesake Ohlmann Family who has helped guide our course for the past 66 years, but because of the close-knit family atmosphere that they nurture every day. This tribute seemed fitting. Our production, while far less noble in scope than Rockwell’s, was nonetheless fun. Lured by the false pretense of free food, we assembled 10 patient Ohlmann Group employees for the photo shoot led by creative team members Andy Kittles, Gary Haschart. And Meghen Welly. Models were carefully positioned to best mimic the original right down to the “photobomb” from our resident fine artist Gary Hinsche in the lower right corner. Starting with our patriarch Walter Ohlmann at the center of our photo, our dinner party consists of (clockwise): David Bowman, Linda Kahn, Mike Blackney, Meghen Welly, Gary Hinsche, Jason Hart, Gary Haschart, Lori Ohlmann, and Jim Hausfeld. Never one to miss a free meal (real or virtual), even our fine furry friend Benji makes his inevitable cameo as well. From all 26 members of our Ohlmann Group “family,” we wish your family the happiest of Thanksgivings. 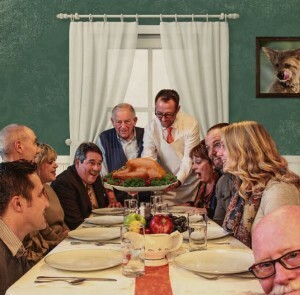 We hope that, like the Norman Rockwell painting, it too is a classic.